- Cut the baby carrots into pieces, and boil half-way (maybe 15-20 minutes). - Cut the potatoes into cubes (about the same size as the carrot pieces). - Sprinkle some olive oil into a pan, and add the carrots and potatoes. Put in the oven at 350 for some 30 minutes. Check regularly, and try with a fork for when ready (the fork will easily go in the potatoes when ready to serve). - Add salt and pepper over the potato/carrot mix. For a yummy reddish tint, either finish them in the over at high temperature (450-500F) for 5 minutes, or add a bit of ground cayenne or chili pepper. 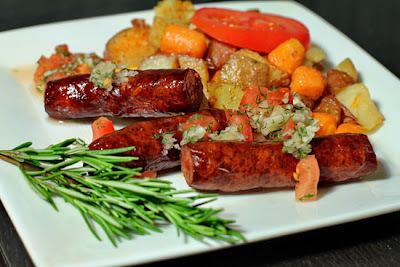 - Serve the potato/carrot mix on a plate, next to the kabanosy, and top everything with mujdei. - A bit of rosemary could add another splash of green to the dish.